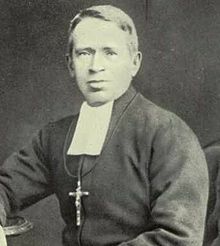 Andrew Kerins, known by his religious name Brother Walfrid, was an Irish Marist Brother and the founder of Celtic Football Club. He studied teaching and in 1864 joined The Marist Brothers Teaching Order. He moved to Scotland in the 1870s and taught at St. Marys School and the Sacred Heart School where he was appointed headmaster in 1874. He also helped found St. Joseph’s College, Dumfries. In 1988, he founded the Celtic Football Club as a means of raising funds for the poor and deprived in the east end of Glasgow. A commemorative sculpture of Walfrid was erected outside Celtic Park on 5 November 2005.